The experts at Chilipepper Appliance have developed an on-demand recirculation pump that delivers hot water instantly throughout your whole house. 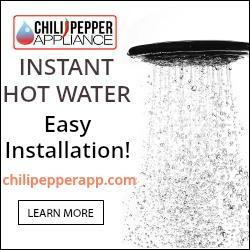 Instant Hot Water with Chilipepper Appliance, Orange County, CA – Homeowners that are tired of wasting water by running faucets and showers several minutes before hot water comes out now have an easy solution. The experts at Chilipepper Appliance have developed an on-demand recirculation pump that delivers hot water instantly throughout your whole house. The Chilipepper pump works with any water heater – even tankless, saving customers time, water and money with every use. Easy to install and powerfully built, this on-demand pump is right for any household or business. The Chilipepper Hot Water Recirculation Pump is a small appliance that quickly circulates the hot water from the water heater to your sink or shower without wasting any water down the drain. A simple touch of a button activates the Chilipepper and once the on-board temperature sensor detects sufficiently hot water it turns itself off! Voila! You’ve got hot water with practically no wait and zero waste. The Chilipepper eliminates the need to run the faucet for several minutes to get hot water. Upon activation, the high-power pump circulates the water from the water heater – whether tankless, tank-type or other – to the faucet. There’s no need to even open the faucet but if you need to use the water while the pump is running, no problem! The sink and faucet still work the same as before. Best of all, there’s no fuss! When the hot water arrives, the Chilipepper turns itself off, leaving you free to just enjoy your hot water. The Chlipepper recirculates the cool water from the hot water line back to the water heater to be reheated instead of running it down the drain. Eliminating that wasted water saves thousands of gallons of water every year. A typical family of 4 can save over 12,000 gallons of water per year! Not running that water down the drain reduces the amount of sewage that needs to be treated as well. The Chilipepper is a Green product because, in addition to saving water, it uses less than $2 in electricity per year to operate. Conserve water, energy, and reduce your carbon footprint while saving time and money!